Classrooms are bright and spacious with well defined learning areas. 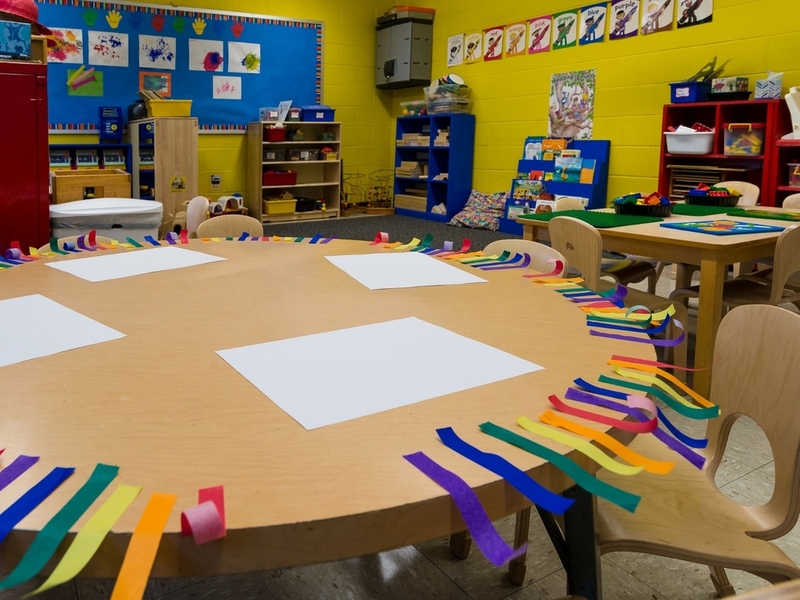 Each room is equipped with blocks, paint, play dough, water table, art and writing tables, puzzles, manipulatives, science materials, and dramatic play spaces to name a few. We have excellent teacher-child ratio's in each classroom, which fosters both large and small group cooperation amongst children. Two well-equipped playgrounds stimulate and encourage gross motor development as well as imaginative and creative play. Outdoors, children are also able to appreciate and explore nature. Much emphasis is put on exploring leaves, rocks, seeds, snow, etc. A large sandbox is equipped with digging tools, trucks, pots and pans, and various collections of dinosaurs, farm animals and people to stretch the imagination and invite participation amongst other classmates. Outdoors there are also large building blocks, as well as a homemade impressive musical wall created by the children. When weather prohibits outdoor activity, there is a spacious indoor playroom, complete with sand tables, tricycles, cars, rocking horses, climbing, sliding equipment and much more. Convenient curbside drop-off and pick-up is available or parents may park and walk their child into class daily. Carpooling with another family is encouraged. The carpool committee does their best to arrange carpools during the summer prior to school beginning in September. We are an allergy-aware school. No peanut butter, peanut products, nut products or products containing nut oils can be brought to the school. Our faculty is experienced and well-trained in the care of children with allergies. Many families choose the Roslyn Trinity Co-op for the care we provide for children with allergies.